In every interesting family there are skeletons in the cupboard - a relative about whom "we don't talk" or a neighbour "we don't speak to". 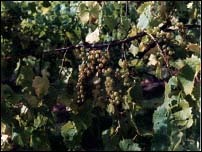 The vines of England have Muller Thurgau and the hybrid Seyval Blanc. We do not yet grow very much of the 'classic vines' - the Riesling, Muscat, Traminer or Cabernet Sauvignon. However, we increasingly grow Chardonnay, Pinot Noir and Pinot Meunier. 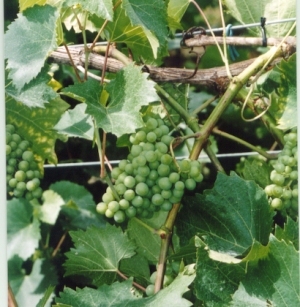 Of the rest, the vines are the result of crossing and hybridisation carried out mainly in Germany which has climatic problems similar to our own. Behind many of these crosses lurks Muller Thurgau, a Riesling/Sylvaner cross developed by Herman Muller of Thurgau in Switzerland. 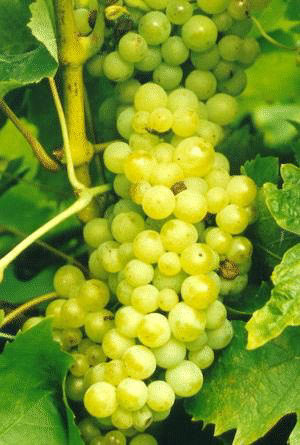 Once, there were large acreages of this grape, but now very few vineyards grow it, prefering Bacchus, a similar cross. Another of our skeletons is the EEC despised Seyval Blanc, a French/ American hybrid , deemed unsuitable for respectable wine growing countries (i.e. the French do not like it) and is banned from our Quality Wine scheme. However it grows well, is largely disease free and crops every year- hence its nickname of 'Save all'. It can be used to produce an excellent sparkling wine. What is noticeable is the planting of vines especially for sparkling wine. In the south, this has meant the 3 tradional vines used in the Champagne, Pinot Noir, Pinot Meunier and Chardonnay. 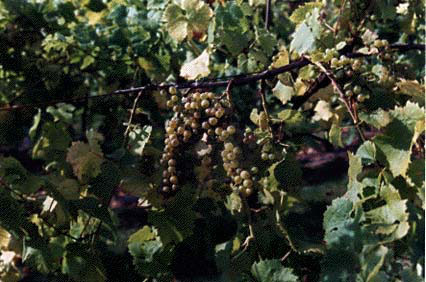 There has also been an increase in the planting of Frueburgunder, the early type of Pinot Noir. Slightly muscat flavoured wine. Popular amongst some major growers for single varietal wines (medium or dry depending on the year) Cross of Wiener Gudedal and Courtillier Musque. Risky but rewarding. The public buy the wine as fast as we make it! Cross of Muller Thurgau (!) , Madeleine Angevine and Gewurztraminer. Produces a scented tasty wine with a slight flavour of mango. Any wine with this one in is usually worth rolling around in the mouth. Spicy cross of Sylvaner, Riesling and Muller Thurgau. This one really is incestuous! 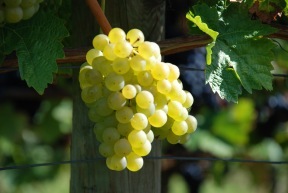 Posh name for Muller Thurgau, - an abbreviation for Reisling Sylvaner. Declining, but still amounts to 13% of total plantings. 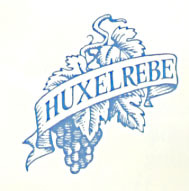 Siegerrebe Another crossing produced at Alzey from Madeliene Angevine and Gewurztraminer. This is a very early variety with pleasant light floral tones. Revels in Summer heat-waves, low in production and beloved of wasps. However it is well worth growing. Derived from a Merzling x (Saperavi Severny x Muscat Ottonel) cross. (N.B: The latter pairing is also known by the technical name Geisenheim GM 6493). Grown at Ryedale Vineyard in Yorkshire, Wroxeter and Ludlow Vineyard Yields a rich, flavoursome white wine with hints of muscat and honey.